ATTENBOROUGH is a pleasant village rapidly coming under the sway of suburbia, and its church is a delight if only for the beauty and interest of the carvings and grotesques which are to be found in and about it, while its churchyard preserves sombre memories of the terrible explosion at the Chilwell Munition Works during the Great War, which wrought such havoc and which brought to the surface such heroism. 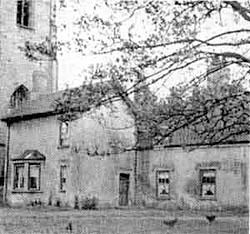 But Attenborough’s chief claim to fame is the possession of the house, hard by the church, where in 1611, Henry Ireton was born. He became a gentleman-commoner at Trinity College, Oxford, and afterwards read for the law, but was never called to the bar. He was residing at Attenborough when the Civil War broke out in 1642, and raising a body of Puritans he joined the Parliamentarian Army, was promoted to the rank of major, and saw much fighting, particularly at Edgehill, Gainsborough and Marston Moor. His legal training distinguished him and he was much employed in writing declarations, army orders, and so forth, and in 1646 he married Bridget, daughter to Oliver Cromwell. He was one of the Commissioners who signed the death warrant of King Charles I., and in 1649 he was sent to subdue Ireland. He died at the seige of Limerick in 1651, was buried in Henry VII.’s chapel at Westminster, and commemorated by a magnificent monument. In 1661, after the Restoration, his body was disinterred, and his monument destroyed. "January 30th, 1661. This day (Oh, stupendous and inscrutable judgment of God) were the (bodies) of those arch rebels, Cromwell, Bradshaw and Ireton dragged out of their superb tombs in Westminster, amongst the kings, to Tyburn, and hanged on the gallows there from nine in the morning till six at night, and then buried under the fatal and ignominious monument in a deep pit, thousands of people who had seen them in all their pride were spectators". Ireton was, indeed, hated by the Royalists, and perhaps they had good reason to object to his intolerance, but Woods, one of these Cavaliers, was man enough to say of him that he was "absolutely the best prayer maker and preacher in the army."